CINCINNATI, Dec. 6, 2018 /PRNewswire/ -- Voting begins today in Halo's Most Interesting Nurse™ in the World contest. The finalists were chosen from nurses across the country who were nominated by their peers as extraordinarily caring and interesting individuals. 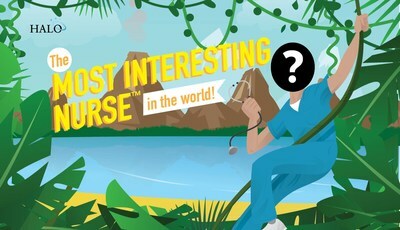 The winner of the contest will receive a $5,000 vacation – something a lot of nurses need! The selection committee included Director of Nursing Informatics and Halo's own Most Interesting Nurse in the World, Ali Morin, and Chair of Halo's Nurse Advisory Council Kathy Oliphant. "The nominations we received were incredible," said Morin. "It was inspiring to see the kinds of work all of these nurses are doing day-to-day, and the different kinds of activities they do in their personal lives. It will be difficult to pick a winner from these finalists!" Halo's mission is to streamline collaboration, so clinicians can focus on care. The Halo Clinical Collaboration Platform™ enables mobile collaboration for healthcare by consolidating secure messaging, on-call scheduling, VoIP and mobilization of critical alerts, all powered by the Halo Clinical Workflow Engine™. This enterprise-wide platform helps protect clinicians from alert fatigue and burnout, and patients from delays in care.